West Gash is the western highland region of Vvardenfell. 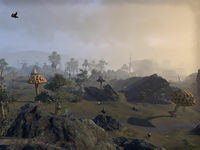 It stretches from Balmora on the edge of the Bitter Coast in the south, past the Redoran mining town of Gnisis on the west coast, to the Urshilaku Ashlander Camp on the edge of the Ashlands in the north. To the east, in a separate pocket of the Ashlands, sits the Ashlander holy site of Ald'ruhn. According to local legend, the West Gash was formed by a violent battle between Lord Vivec and the Ruddy Man.